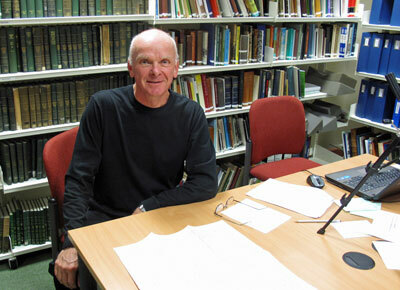 Photo taken at the Leeds West Yorkshire Archives in the fall of 2013. My wife's Simpson line were tenant land holders and are present in the Idle manor records of the 17th & 18th C. This was my first experience handling parchment. A little bio: Born in Trenton, Ontario, now retired, and interested in family roots and history for many years. Now I have the time to indulge my interest. My direct Quinte ancestral surnames are: Saylor, Meyers, Vandewater, Hubbs, Clapp, Yager, White, Marsh, Dings, Vanalstine, Millar, VanKleek, Haviland, Jones. I have had the pleasure of being invited to speak a few times. Fun to meet new people and share our interests. 18 Nov 2017 - The relationship between Loyalists and Quakers - Sir Guy Carleton Branch, UEL Assoc, Ottawa. 28 Feb 2019 - Timothy Rogers Jr: Quaker to Slave Master - Black History Month for CFHA at Friends House, Toronto. For those interested, these are excellent free programs that I use. KompoZer is my web page creation program. FileZilla Client for uploading web pages. Often I put pages here that are works in progress.